Just for a change, here's some charter news as Charter & Charter send word that the 39m motor yacht Sensei is available for charter in Croatia and the Adriatic Sea from August 13th. Under the current owner a €2.6 million major refit was undertaken on Sensei at the Benetti shipyard in Italy in 2006/2007. The work included a complete engine rebuild and reconstruction of many other areas and also an update of the navigation and communications equipment necessary to accomplish full MCA classification. Sensei accommodates 10 guests in a main deck master suite along with two double and two twin cabins and has extensive deck areas for relaxation and alfresco dining. The charter rates are from €98,000 per week with no delivery fees. 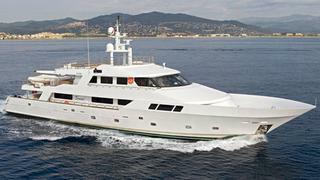 Sensei is also listed for sale by Charter & Charter and CSO Yachts asking €5.6 million.